Charles L. Grigg, founder of Seven-Up, became involved in the beverage industry as a salesman for Silverster "Vess" Jones at Whistle and Vess Beverages, Incorporated, in St. Louis, Missouri. While under the employment of Jones, Grigg developed the orange drink he called Whistle. Unable to get along with Jones, he left in 1919, invented another orange drink "Howdy", and joined with Edmund G. Ridgeway in 1920 to form the Howdy Company. The new company thrived through Prohibition and introduced another new soft drink at the beginning of the Great Depression in 1929. Despite the catchy names used by Grigg in his early inventions, he chose to call his new drink "Bib-Label Lithiated Lemon-Lime Soda". A Seven-Up historian stated that "Grigg wisely changed the name before significant damage was done". The drink next became "7UP Lithiated Lemon-Lime" and then, simply, "7UP". Although the origin of the name is uncertain, Grigg may have been inspired by a cattle brand that consisted of a "7" and a "U." With the end of Prohibition in 1933, the company marketed Seven-Up as a hangover cure as well as a drink mixer. 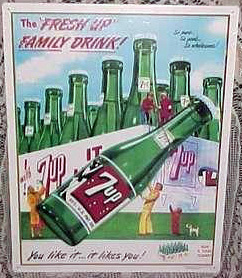 By the mid-1930s, Seven-Up was franchised in Canada. Charles Grigg died in 1940, and his son, Hamblett C. Grigg took command of the company. Grigg used patriotic advertisements to carry the product through the wartime sugar rationing. Seven-Up expanded into the Caribbean and South America in 1948 and soon spread world-wide. The Uncola promotion, begun in 1967, was one of the company's more inspired advertising ideas. Philip Morris Companies, Inc., instigated a takeover in 1978 and managed the organization until 1986. At that time, PepsiCo, Inc., bought the international rights to Seven-Up, and an investment group purchased the American holdings. Two years later (1988), the company merged with Dr Pepper to form the Dr Pepper/Seven-Up Companies, Inc. Cadbury Beverages acquired the joint companies in 1995. For many years, 7UP was on the low end of collector desirability, but since the 80s, that has slowly changed. 7UP, as well as its first cousin, Howdy, has been gaining. There are nice varieties of cardboard signs, cutouts, bottle displays from the 30s thru the 50s, thermometers and tin signs for the collector. There are very little consistency with the serving trays or calendars, but a number of very nice pin-up type of "pretty girl" calendars have turned up over the years. 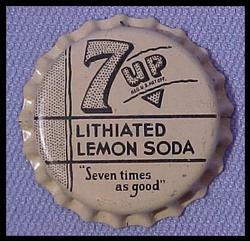 First: 7UP Lithiated Lemon Soda. Amber w/paper label. Second: 7UP. Green bottle w/embossing. Second and Third: Foreign 7UP bottles. Green ACL.